We would like your visit to Matobo Hills Lodge to be about You. Find your own space amongst the eternal granite domes. Design your own days. Do as many or as few activities as you wish. How you spend your time with us is your choice, but getting the small things right to make that special difference, is ours . Matobo Hills Lodge cooks with the seasons supported by the local Matabele farmers & butchers. Meals are served African style over a wood fire by passionate local chefs. We embrace the seasonal whims of the region, focusing on the freshest Zimbabwean produce from our trusted suppliers. The Matobo Hills offer a wide variety of thrilling activities not to be experienced anywhere else in Africa, from the heart-pounding adventure of tracking the rare and endangered rhino on foot, to exploring ancient African caves and discovering hidden gems of artwork left behind by the spiritual bushmen who inhabited the area thousands of years ago. Weddings, retreats, small corporate gatherings, group dinners, cocktail receptions, banquets and social gatherings are ideal for guests who are looking to indulge, impress and network. Contact us now to find out how our event planners can help make the perfect occasion. Each room sleeps 2 people with twin beds. The en-suite bathroom has a separate bath or shower. These rooms epitomise African design and charm and are built in the shape of a traditional African homestead. They offer generous space allowing for 2 comfortable separate beds. The thatched double-bed lodges have rustic granite origins which are evident in the subdued colors, discreet patterns and rich fabrics. Complete with slate bathrooms and classic African furnishings, the soul of Matobo Hills Lodge lies in its charming cultural décor. Bring your family in this spacious chalet! Spacious, bright, outward facing thatched family rooms sleep up to 5 people in single beds, these rooms come with comfortable mattresses and pillows, fully equipped bathroom, with magnificent glass windows offering views of the Matobo Hills or the secluded bush surrounds. Perfect for the whole family. Thank you so much for making my birthday memorable. The staff was so good and they made sure we were well taken care of. Excellent food and yah Zulu, best tour guide I have ever met. I recommend Matopos and will definitely come back again! It is a fantastic place to be with your family. And, the food is quite tasty esp the bush meat. I recommend it for those who need a piece of mind esp when making big life decisions. Amazing place, amazing staff, fantastic food, bush dinner on point, guide Zulu the best. Totally loved being there this past weekend. It’s a little heaven totally recommend it. I do not have the words to express how amazing Matobo Hills Lodge is. The staff … oh my God … professional, friendly … cannot believe the service is in Zimbabwe. The Chef … always always cooking delicious food that inspired and enhanced our experience. The scenic view…heavenly. And of course … a well stocked bar. Thank you Matobo Hills Lodge for making my husband’s surprise birthday perfect! Will be back with my family and friends. This place was lovely. They went all out to make my evening amazing and even made me a surprise cake. My friends from Mozambique and Zambia were impressed to see this beautiful side to Zimbabwe. I am planning another trip soon and this time I think I will be staying longer . Thank you Matobo Hills Lodge. We loved the environment and the setting as soon as we set foot at the lodge. Great staff on hand, pleasant, hospitable and always ready to extend a helping hand. Meals were delicious, particularly the dessert. It’s a great place to get away from the hustle and bustle of town life. Enjoyed going up the mountain trail, great views from the granite mountain top. We regret spending only night, so I am sure another trip is on the books. Overall, though short, it was a lovely experience! This was just what we needed. We wanted to get away from it all to celebrate a milestone in our family. We experienced great service, informative game drives and a fantastic rhino tracking experience! The rock scenery is unique and just awesome! I spent 2 nights at Matobo Hills Lodge with 7 members of my family in mid August 2017. Quite frankly we were all absolutely delighted with the place. The setting right in amongst the imposing granite domes of this beautiful area is quite awe inspiring. Wonderful setting in the African bush with cheerful helpful staff, wonderful rondaval rooms perched on rocks overlooking the Motobo Hills. Perfect – you could even get wifi in the main lounge. Please visit when you are next in the area. Thanks you one and all. Stayed at the Lodge for a week – amazing setting! Visited Rhodes Grave and got to see some White Rhino nearby. The Chalets are clean and comfortable, but what makes the Lodge stand out is the friendly staff who cannot do enough for you, Had some reservations about visiting Zim – these were unfounded, a great country and lovely welcoming people – would visit again. Matobo Hills Lodge is a must go place in Zimbabwe. Fantastic service, breathtaking panorama above the hill and tranquil. I wouldn’t trade my experience at Motobo Hills Lodge for any other. I highly recommend it. We (my partner and I) stayed for two nights and only wish we could have stayed longer. This place is just so amazing, the staff were wonderful, the room was lovely, the service second to none, the food scrumptious and generous. 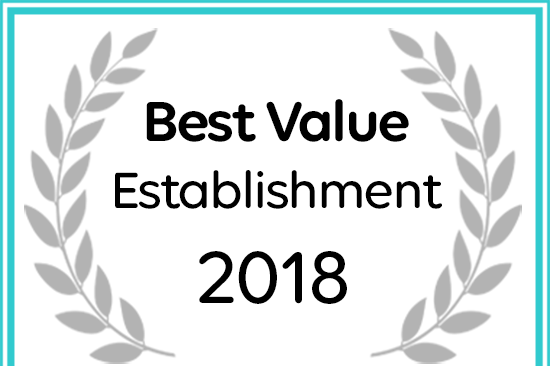 Matobo Hills Lodge has been named a 2018 Best Value Establishment for Matobo National Park Accommodation.